I have something of a love hate relationship with generative processes particularly those using fractals. Fractals are complex geometric patterns that can resemble natural objects. 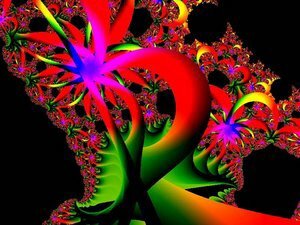 Polish mathematician Benoit Mandelbrot invented the term fractal and argued that many natural processes that had previously been too complex for the formulae of traditional mathematics could be described by using fractals. Given the computers propensity for computation it is a relatively straightforward process on a Mac to create images that resemble natural phenomena by using fractal algorithms. So far so good, except that the aesthetic barometer often seems to have been left at home by many artists using fractal software. Twirling swirling organic shapes suspended above lunar landscape are often the order of the day. Its all rather like some Arthur C Clarke Sci-Fi novel come to life. Add some cascading synths a la Tangerine dream and you have one cosy tripped out bit of nonsense. Here for example is a typical bit of fractal art (artist unknown). However what if one could take hold of the process and in a push pull sort of set up ride the fractal wave without letting it go all gooey on you? What if you could use fractal technology to look into the underside of organic mutation? 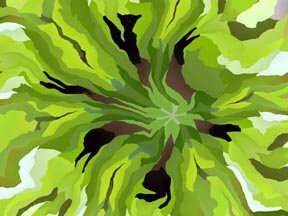 What if rather than using fractals to create organic looking shapes, you took photographs of organic shapes and used fractals to disassemble them? Such thinking was behind woodgreen. A simple picture of some foliage is turned in a self-propagating algorithmic undergrowth that grows and simultaneously self dissects. The soundtrack is composed by the variations in shape and colour. An extract from woodgreen can be seen here.